The founders of private-equity firm Carlyle Group LP collected nearly $212 million in dividends and other compensation in 2016, a 28% drop from a year earlier. 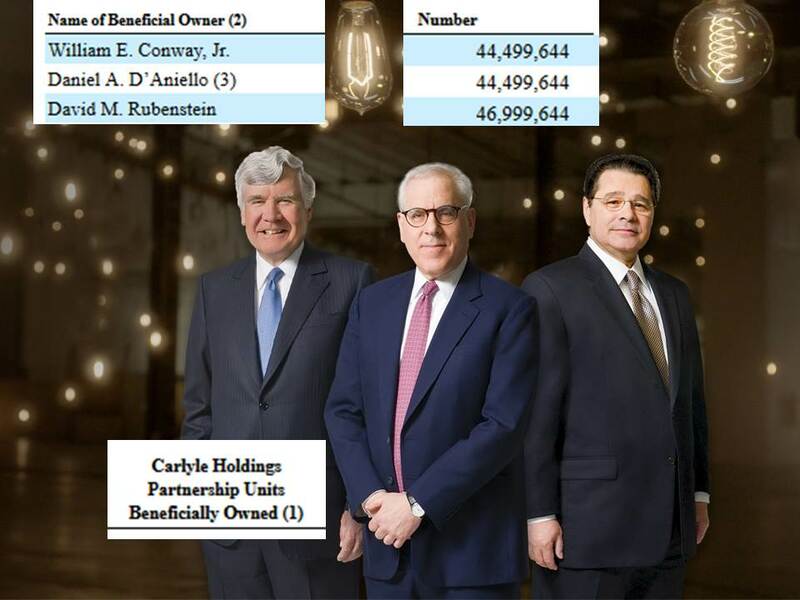 David Rubenstein collected $73.1 million, while his co-founders, William Conway and Daniel D'Aniello, each earned $69.3 million in 2016, according to a regulatory filing. Dividends from Mr. Rubenstein's stake in the firm accounted for $72.8 million of his annual earnings. He received a $275,000 salary and a $6,625 company contribution for a 401(k) program. In the normal course of business, our personnel have made use of aircraft owned by entities controlled by Messrs. Conway, D’Aniello and Rubenstein. Messrs. Conway, D’Aniello and Rubenstein paid for their purchases of the aircraft and bear all operating, personnel and maintenance costs associated with their operation for personal use. Payment by us for the business use of these aircraft by Messrs. Conway, D’Aniello and Rubenstein and other of our personnel is made at market rates, which during 2016 totaled $16,695 for Mr. Conway, $170,850 for Mr. D’Aniello, and $398,530 for Mr. Rubenstein. We also made payments for services and supplies relating to business use flight operations to managers of the airplanes of Messrs. D’Aniello, Conway and Rubenstein, which during 2016 aggregated $667,781 in the case of Mr. Conway’s airplane, $1,004,292 in the case of Mr. D’Aniello’s airplane and $2,795,585 in the case of Mr. Rubenstein’s airplane. Certain of these services were performed by one of our former portfolio companies, Landmark Aviation. Consistent with the terms of our agreement with Landmark Aviation, in 2016, we received payments from and made payments to Landmark Aviation to adjust the estimated annual costs of operating the aircraft related to 2015 flight operations. In 2016, we received payment from Landmark in the amount of $116,568 related to Mr. D’Aniello’s aircraft, and made payment to Landmark in the amounts of $68,850 and $111,063 related to Mr. Rubenstein’s and Mr. Conway’s aircraft, respectively. Sweet, given the kind of year Carlyle had. Carlyle Group reported assets under management of $157.6 billion as of Dec. 31, down 7% from three months earlier and down 14% from a year earlier. 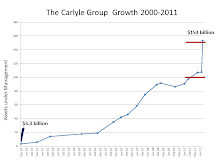 I wonder how investors in Carlyle's losing hedge funds feel about the big payday for Carlyle Chiefs. "I had a choice. I could be an insider or I could be an outsider. Outsiders can say whatever they want. But people on the inside don’t listen to them. Insiders, however, get lots of access and a chance to push their ideas. People — powerful people — listen to what they have to say. But insiders also understand one unbreakable rule: They don’t criticize other insiders." --Larry Summers, Ph.D.
As income and wealth rises to the top, so does political power. When something starts to stink, it's good to find out what's rotting. Oftentimes, it's truth decay. Does the world become a dark comedy as you age? Was it always that way and I just noticed? Cheers to All American Private Equity! Carlyle, Hellman to CRO over PPD Sale?